​Sheep in a small flock on a southwest Texas farm are noted to be losing patches of wool. Some of the sheep have been observed to scratch themselves against trees and fence posts, and pieces of wool are regularly being left behind. Tags of wool on the animals appear to be sloughing off. A few of the animals have areas of severely excoriated skin due to intense scratching. A sample of wool and serous crusting are submitted to a parasitology diagnostic lab. This organism was found in the in the crusted serous material (100X total magnification). The organism above causing the pruritic condition in the sheep is Psoroptes ovis. Note the acarine’s long legs, and the pretarsi with long-three-segmented pedicels. This mite does not burrow into the skin. Instead, it remains at the base of the hair and uses its stylet-like chelicerae to pierce the skin, resulting in serum exudate which will scab. 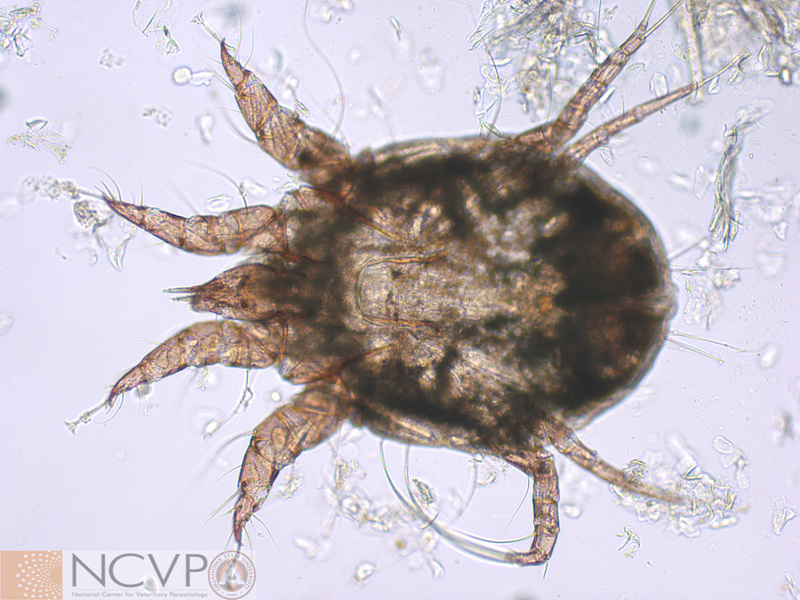 This form of mange is commonly called scabies or “scab”. When skin areas become overly hardened with crusted serous material and debris from scratching, the mites migrate to new areas, resulting in hair loss and scabbing that spread over the surface of the body. In addition to economic loss due to compromised wool production and quality, psoroptic scab can be devastating to the health of sheep, as they may become severely debilitated, and perhaps even die. The condition is reportable.